Almond varieties are classified as either sweet or bitter. The almonds widely available for eating are known as the sweet almond, of which there are over 100 varieties grown in California alone. 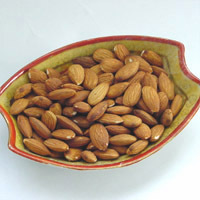 The bitter almond contains toxins that are removed from the bitter almond oil before it is used in food production. Bitter almond oil is used primarily as a flavoring, and it is also used to make amaretto liqueur.